Sainte Marie-de-Ré is a small commune on the southern coast of the Île de Ré, an island off the French Atlantic coast. Although far from the main battlefields of the Second World War, nevertheless the communal cemetery of the district is the final resting place of five British and Commonwealth soldiers and two airmen. Their graves are maintained by the Commonwealth War Graves Commission [Photograph No. 1]. Photographs No. 2 and 3 were taken by Jacques Lefebvre-Linetsky during a visit to the Île de Ré in June 2017. Initial research for this article at the Île de Ré was by Cathie Fidler. The five British soldiers in this cemetery, one of whom was unidentified, were lost at sea when the RMS Lancastria was sunk by German bombers on 17 June 1940. Before the Second World War the Lancastria had been a Cunard liner but was requisitioned for the war effort by the British Government. On 17 June 1940 Lancastria was evacuating the remnants of the British Expeditionary Force (B.E.F.) and some civilians from Saint-Nazaire. About twenty minutes after disembarkation, she was bombed by German aircraft and sunk. Exactly how many lost their lives remains unknown to this day but it is believed to be more than 4000 and is regarded as the worst maritime disaster in British history. Some of the bodies of those lost were washed ashore including the five soldiers buried at Sainte Marie-de-Ré. With the sinking of the Lancastria coming at the same time as the fall of France and with the Battle of Britain about to begin, news of the catastrophe was suppressed by none other than the British Prime Minister Winston Churchill. In fact on the following day, 18 June 1940, that Winston Churchill made his "Finest Hour" speech and General Charles de Gaulle his 'Appel du 18 juin', two defining moments in the history of the war. The fate of the Lancastria and the many thousands that died remains largely forgotten to this day. At 18:00 h on 16 October 1942 a Wellington Mk III, X3946 KO-Q with a crew of five and piloted by New Zealander Sergeant (Pilot) Douglas Huntly Gordon, took off from RAF Mildenhall, Suffolk. Its mission was to undertake minelaying operations off the western coast of France as part of the war against the U-Boat menace in the Battle of the Atlantic. The aircraft failed to return and all the crew were lost. 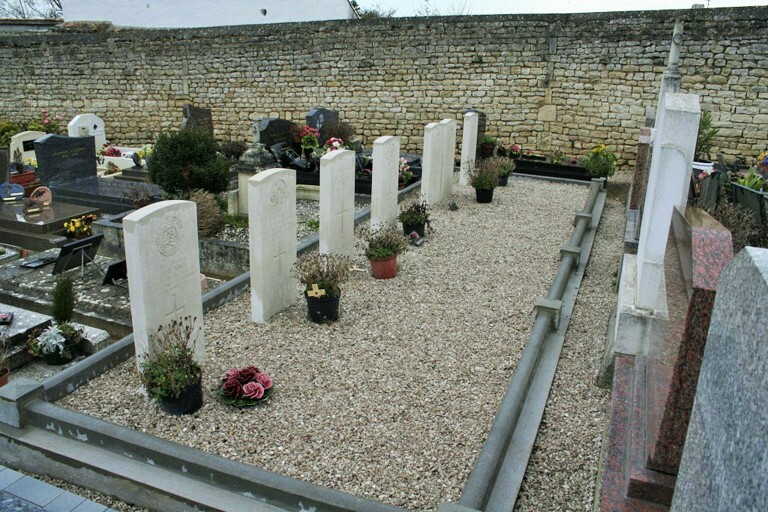 The bodies of three of the five aircrew were later identified and laid to rest in cemeteries on Île de Ré. New Zealander Sergeant (Pilot) Douglas Gordon is buried in Le-Bois-Plage-en-Ré Communal Cemetery. Sergeant David Buchanan (Navigator) and Sergeant Cyril George Parr (Wireless Operator / Air Gunner) are buried in a joint grave in the CWGC plot at Sainte Marie-de-Ré. No positive identification of the two remaining aircrew was ever found and so they are they commemorated on the Runnymede Memorial in Surrey. Their names were Sergeant Cyril Robert Stoward and Sergeant Edwin Thomas Port of Fulham, London. Regiment/Service: Argyll and Sutherland Highlanders, 6th Bn. Regiment/Service: Royal Army Ordnance Corps, 2 Ordnance Workshop Coy. Son of Meshak and Mary Elizabeth Worrall, of Stanley, Derbyshire. Son of William Francis and Edith Annie Elliott Dyas, of Aldershot, Hampshire. Regiment/Service: Royal Air Force Volunteer Reserve, 115 Sqdn. Grave Reference: Joint grave 5. Husband of Gwyneth M. Parr, of Gravesend, Kent. Husband of Mary Ellen Sullivan, of Manningham, Bradford, Yorkshire. W.R. Chorley, "RAF Bomber Command Losses of the Second World War"
I visited this graveyard last week, looking for my grandfather's grave.I did not see the gravestones shown in the photos above. When trying to locate the graveyard, I asked how to find it in the tourist information office- they told me there were no gravestones, though they knew that there were some drowning casualties buried there. I wonder if the gravestones have been removed since the photos shown on your site, or if I just didn't find them? They can't have been removed! They are in the graveyard of Saint-Marie de Ré, quite close to its entrance, running parallel to the gate. I am having research done there to find out when the bodies were washed to these shores, but it seems difficult to have access to the information if ever it was written down somewhere in the village's archives. If and when I obtain it,I'll post it, of course. Two other bodies were not identified. One was found as late as Novembre 5, 1940, the other on July 14, both in a state that could not permit identification. If anyone wants more details or copy of the certificates, I'll be happy to oblige. And of course, the graves are still there for those who want to pay their respects. The deaths of the aviators were not recorded, however. Maybe they were, in another village on the island, and buried where there were already a few British soldiers. Maybe. This comment is just to clarify the number of official casualties recognised by the CWGC at this cemetery, which comes to a total of seven. 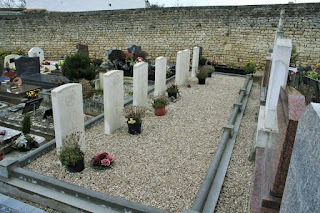 These are the six casualties whose identities are known and whose names are listed by the Commission as being buried here, plus the unidentified British soldier whose body was found on the beach here on 14 July 1940. There was insufficient evidence found at the time regarding the 'unidentified male' whose body was found by the local village 'Bobby' on 5 November 1940 to prove beyond doubt he was an Allied serviceman, although it seems more likely he was lost with the sinking of the Lancastria. Consequently he is not counted by the Commission as an official Allied war casualty at this cemetery. Nevertheless, he will be commemorated on a memorial elsewhere (i.e. for those with no known grave). Looking at the official document obtained by Cathie and her friend at the Town Hall, unfortunately there is not enough evidence to submit a case to the CWGC asking them to include this man as an official war casualty for this cemetery. We shall have to remain content that he is "at rest" and "Known Unto God". (Thanks to Cathie and her friend for the additional research and documents from the death register at the Town Hall). Thank you Cathie for the info- it is good to have the dates. My sister has since visited the graveyard and found my grandfather's grave without problems so all is well.